The 27th Men’s Southbroom Amateur Classic was played from 3rd – 7th July 2017. It was a fabulous tournament, enjoyed by all!! Once again we held a wonderful Southbroom Mens Amateur Classic with sparkling weather, great food and drink, tons of laughter and friendship together with some special golf. The course was playing dry and fast with firm quick greens, so shorter than normal and if you got it right the players could put some very good scores together, which is what happened. There was a little wind on day one and two and twelve teams within three shots of the lead. Day three (which the pros call moving day) there was some serious moving with Graham and Guy Barkhuizen making 53 points in the morning to separate them elves from the field. The afternoon was even better with Chris Miller and Tony Routledge making 54 points. Chris doubled the first hole only to be saved by Tony’s 4 for 3 points, then Chris played the next 17 holes in one over par shooting 75 off a 18 handicap. Truly great golf for a guy who hasn’t been 100% well but proof that good scoring was not impossible with the correct strategy. Too many players smashing drivers off the tees and spending the day in trouble! This put the two teams well clear of the field and playing together on the last day. A two horse race. 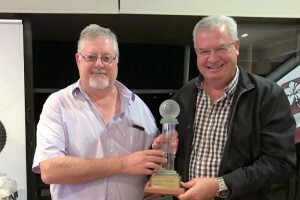 Locals Bernie Vorster and Des Erasmus had other ideas sneaking in under the radar with 51 points only to finish one point behind the two leading teams. Graham and Guy made 45 points catching Chris and Tony who made 44 points. The tie meant a count out which goes the way of the best last day giving the trophy to the Barkhuizen brothers and the second time that Chris and Tony have lost the Classic on a count out. So to the end of a wonderful weeks golf and fun and a big thanks must go out Hibiscus Brokers & Barry Elliot for being our Umbrella Sponsor and to all our other wonderful sponsors who make the event so special. Click here to be placed on the 2018 invitation list – Monday 9th to Friday 13th July 2018.